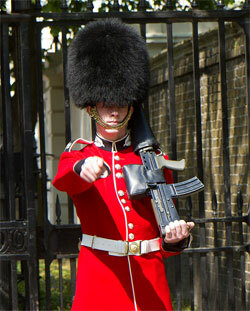 There are five Regiments of Foot Guards in the Household Division, the Grenadier Guards, the Coldstream Guards, the Scots Guards, the Irish Guards and the Welsh Guards, who normally provide the Queen's Guard at Buckingham Palace. 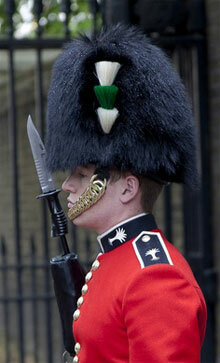 The Foot Guards have two roles in the British Army. First and foremost they are highly trained infantry soldiers who carry out operational duties worldwide. In addition to their combat role the Guards train for Public Duties where they take part State and Royal ceremonial events. 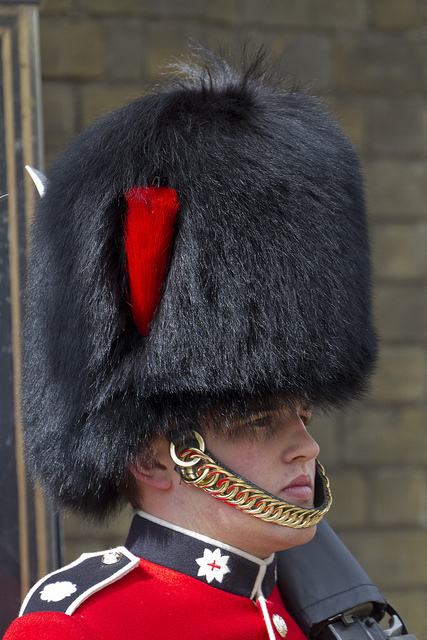 The scarlet uniforms and bearskin caps of the troops you see Changing the Guard at Buckingham Palace may appear the same at first glance, but there subtle differences. Click or tap a Guard to see how you can to spot the difference in their uniforms and know which regiments are taking part in Changing the Guard. 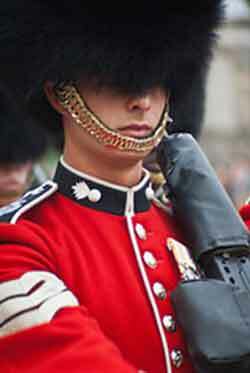 Each Regiment of Foot Guards has a Regimental Band, who are part of the Army Corps of Music. During Changing the Guard at Buckingham Palace the Bands provide musical support playing a selection of music that ranges from stirring military marches to popular tunes including theme music from films and TV shows. In addition to their Regimental Band each battalion has, with the exception of the Scots Guards, a Corps of Drums. The Scots Guards, and the Irish Guards, who in addition to their Corp of Drums, have a Pipe Band who can be seen occasionally at both Buckingham Palace and Windsor Castle. From State Ceremonial events in London to overseas Military Tattoos, the Bands of the Household Division can be seen supporting the military and promoting the UK at events around the world. ?No One Assails Me With Impunity? The Guards Museum is a hidden treasure, off the side of St. James's Park. Packed with information about 'The Guards' the museum website gives details of opening times and the exhibits on display. 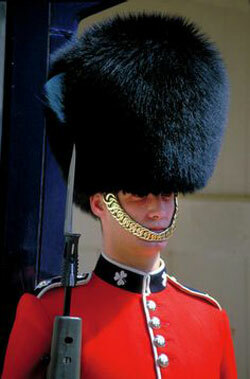 You can even dress up in a real Foot Guard's uniform, bearskin cap and all. The confirmed dates for Changing the Guard are normally released by the British Army in the latter part of the preceding month. Dates for the Changing of the Guard are under constant review so checking the calendar is recommend.